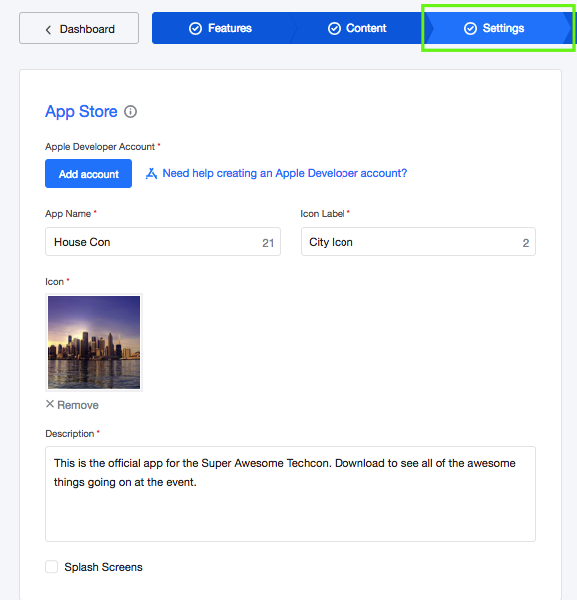 Choose a unique name and icon label for your event app to differentiate it in the app stores. The full name of your application will appear in the App Store and will be the primary way attendees find your app when searching by keyword. In the vast majority of cases the app name will match your event name. For example, if your event is called "Affiliate Summit West 2019" you'll want to make that the full app name. The Icon Label is the short text label that appears under the icon on your phone or tablet. The icon is small so there's not a lot of room under it to include a label. You'll want to keep it short and simple, using the example above if your full event name is "Affiliate Summit West 2019" you might want to choose "ASW '19" as your Icon label. Please note that once the app is published changing the App icon or label requires us to resubmit it to the app stores. Because we will need to rebuild the app and resubmit, we charge $199 for this service. Also please keep in mind that this is only available for branded apps. If you have questions or need additional support please don't hesitate to email us: support@attendify.com.